The rebels have been spotted in the distance. Jump onto the control center to pinpoint their location, load the dual shooter, arm the blasters and fire! With your help, the Imperial Troopers will send those rebels running for cover! Last known price is 6% below the initial Lego retail price! The Galactic Empire™ Battle Pack (75134) Lego set is no longer directly available from the sites below. However, 3rd party partners of these sites might still have the set available. 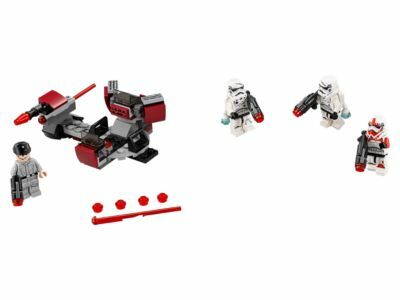 Alternate description Recreate action-packed Star Wars battles with this Galactic Empire Battle Pack with control console, dual stud blaster station, spring-loaded shooter and 4 minifigures. Includes 4 stud blasters and extra ammo. Accessory elements include 2 jetpacks and 3 Imperial Trooper helmets. Recreate endless LEGO® Star Wars battle adventures. Measures over 1” (4cm) high, 3” (10cm) wide and 2” (7cm) deep.